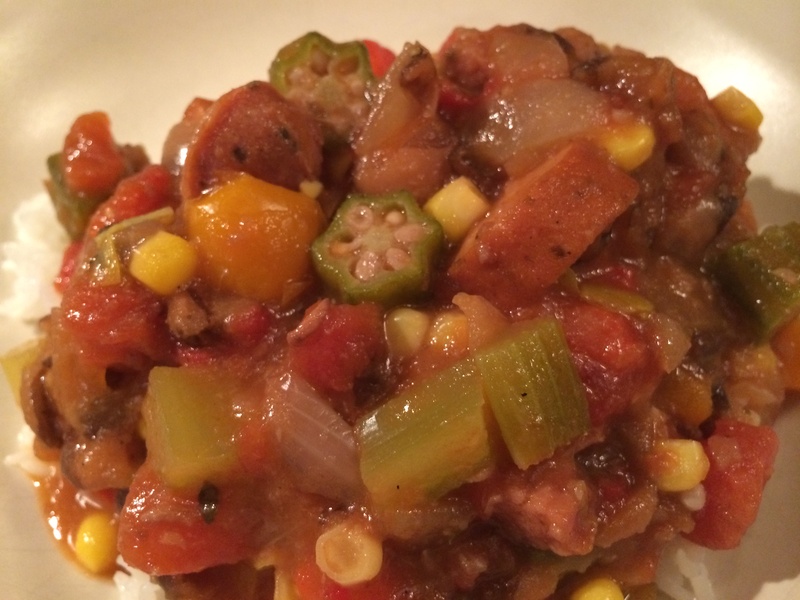 When I’m in the mood for comfort food that is delicious and healthy, I make this Cajun style beans and rice dish. It’s a great way to introduce new vegetables, like Okra, to the 3 year old crowd. The secret to this dish is using good, fresh beans cooked the old fashioned way. I ordered these funky beans with cow spots called Black Calypso from Rancho Gordo. They cook up really buttery and maintain their shape nicely. Skip the overnight soak. If you have a crock pot, just add water, 1/2 an onion, and a bayleaf. Set to cook for 3 hours and forget it. Enjoy! 1. Pre-heat oven to 350 degrees Farenheit. Heat oil in large dutch over medium-high heat. Add onions. Sauté onions for 2 minutes or until translucent. Add Andouille, cook for 5-7 minutes to brown. 2. Remove 1/2 amount of sausage with a slotted spoon and reserve on the side. Stir in bell peppers and celery, cook for 2 minutes. 3. Add tomatoes and bay leaf, season to taste with salt and pepper. 4. Add okra and cooked beans, give a quick stir, cover with lid, and place in oven. Set timer for 20 minutes. 5. Remove pot from oven and taste. Adjust seasoning as desired. If okra is cooked, stir in frozen corn, cover with lid for 5 minutes or until ready to serve. This looks amazing for these chilly nights! Would turkey sausage work as a substitute? Yes, Liza, I used chicken Andouille sausage so turkey would work great as well.